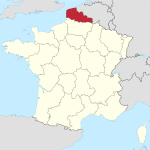 The coal mine in northern France was active from the 1700s to 1900s. UNESCO weighs in on what the mining region contributed to world heritage. "The site bears testimony to the quest to create model workers’ cities from the middle of the 19th century to the 1960s and further illustrates a significant period in the history of industrial Europe" writes UNESCO describing the site. "It documents the living conditions of workers and the solidarity to which it gave rise." Château de l'Hermitage, lieu de la fondation de la Compagnie des mines d'Anzin, Condé-sur-l'Escaut, Nord, Nord-Pas-de-Calais, France. 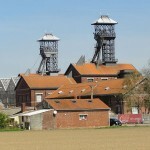 Terril n° 10, 3 de Bruay Ouest. Image of Église Saint-Édouard slag pile by Jérémy Jännick. Map by TUBS.